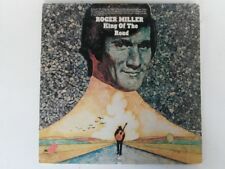 Roger Miller “King High” (2 Records) LP. Condition is Used. Shipped with USPS Media Mail. Cover Condition : Very Good Vinyl Condition : Excellent - Genre : Folk, World and Country Small Stains To Cover. (1: near mint, 2: very good, 3: fair, 4: pretty darn worn). Artist:Carllile, Thumbs. Title:Roger Miller Presents Thumbs Carllile a member of Roger Miller's band from 1964 to 1972. Label:Mercury MGS-27074. Title:Madcap Sensation of Country Music. Artist:Miller, Roger. Jacket Condition:minor wear, shrink wrap. Near Mint records will look like new or almost-like-new, with at worst, a minor surface mark(s). Yellow Golden Records, "THE LORD'S PRAYER". I believe this record is from the 50s. The Lord's Prayer Mitchell Miller Chorus and Orchestra. The front of the paper cover has a very colorful picture of Roy Rogers with a stain glass window behind him. Excellent hard to find album. We are planning to list over 10,000 albums this year. In lightly used condition (unless otherwise noted). Condition of the vinyl; NM! FOR EACH ADDTIONAL LP AFTER THE FIRST ONE. ALL OTHER COUNTRIES. Roger Williams ‎– Roger Williams Plays The Hits. Released: 1965. Format: Vinyl, LP, Stereo. Vinyl - NM condition (looks new - record plays w/o skipping). A4 The Girl From Impanema 2:12. Sleeve - VG condition (minor seam wear, original inner sleeve, see pictures). LABEL / CATALOG #: Smash / MGS-27061. ARTIST: Roger Miller. NOTES: The vinyl looks great with a bunch of surface scratching. VINYL CONDITION: VG . All grades are visual only and I do my absolute best to stick by Goldmine standards. A SIDE - WALKIN' IN THE SUNSHINE. SLEEVE (PLAIN) & VINYL - VERY GOOD CONDITION. Artist : Roger Miller. Title : The Best Of Roger Miller. Catalogue No : SR 61361 - US pressing. Record Condition : Excellent. Cover : Good - corner cut signifies import. ORDERS WITHIN AUSTRALIA (EXCEPT VICTORIA) FOR ORDERS OUTSIDE AUSTRALIA. Values are based on Jerry Osborne's Official Price Guide To Records, 2016 & 2017 Editions. POOR but below. 4 Better than. Records advertised as Sealed or Unplayed should be Mint. POOR: The record will not play properly due to scratches, bad surface noise, etc. FAIR: The record is still just playable but has not been cared for properly and displays considerable surface noise; it may even jump. B4 Who Shot Sam. B1 Jimmie Brown, The Newsboy. B5 Flower Of The Flock. B3 Annette. B2 Poor Little John. Cover Condition : Excellent Vinyl Condition : Excellent Genre : Funk, Soul, Blues, Pop, Folk, World And Country UK Release. BIG RIVER - HUCKLEBERRY FINN. Roger Miller. COVER MUSIC BERLIN - 25 years experience in the trade of Phonograms. Your cover-music team. Cover Condition : Excellent Vinyl Condition : Excellent UK Pressing. Mono. Reissue. ROGER MILLER 6 LP LOT Instant Collection! TITLE:- WALKIN' IN THE SUNSHINE. WALKIN' IN THE SUNSHINE. CATALOG #:- SRS 67092 - STEREO. LABEL:- SMASH RECORDS. ARTIST:- ROGER MILLER. SLEEVE :- VG - Mild wear - small area lifted on fro - - no split seams - in original shrink with tears. The cover and contents suffer from folding, scuffing of edges, spine splits, discolouration, etc. FAIR: The record is still just playable but has not been cared for properly and displays considerable surface noise; it may even jump. Year : 1965 Cover Condition : Excellent - Vinyl Condition : Excellent Genre : Folk, World & Country UK Release. 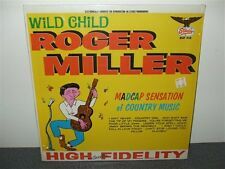 ROGER MILLER, 1964, Vinyl LP Album, GREAT! ROGER MILLER. VINYL LP ALBUM. It is pre owned, used, but in a great conditions! You will get what is shown in the pictures. ROGER MILLER. FOR SALE IS A LOT OF 2 VINYL 45 RECORDS OF. I strive to get them to you as soon as possible, however, circumstances can arise. I make every effort to describe each item I list to the best of my ability. Cover Condition : Very Good Vinyl Condition : Excellent - Genre : Folk, World, Country UK Pressing. Note: Any records purchased from Life of Vinyl will come with a new polythene cover sleeve and will have been cleaned using a professional vinyl record cleaner. You are purchasing the exact record or records in the photo above. Artist : Roger Miller. Catalogue No : 6850 011 - UK pressing. Record Condition : Excellent. Cover : Excellent. You are purchasing the exact record or records in the photo above. All records are cleaned and in good working order. Year : 1965 Cover Condition : Excellent Vinyl Condition : Very Good Genre : Folk UK Pressing Note: Any records purchased from Life of Vinyl will come with a new polythene cover sleeve and will have been cleaned using a professional vinyl record cleaner. Cover Condition : Excellent Vinyl Condition : Excellent - Genre : Folk, World, Country UK Pressing. Reissue. Mono. Note: Any records purchased from Life of Vinyl will come with a new polythene cover sleeve and will have been cleaned using a professional vinyl record cleaner. Year : 1966 Cover Condition : Very Good Vinyl Condition : Good Genre : Country, Folk Note: Any records purchased from Life of Vinyl will come with a new polythene cover sleeve and will have been cleaned using a professional vinyl record cleaner.